Since the last presidential election, fun begins from the nominations stage. This time round, however, nominations of both sides exceed mere ‘fun’ and borders on black humour – would you imagine Mahinda Rajapaksa runs under Maithri’s list and fiery Champika Ranawaka to camp in Ranil’s backyard? So, the proverbial ‘desperate situations call for desperate solutions’. May be. The central plot of the drama so far is the nomination for the former president Mahinda Rajapaksa from the UPFA list. And it was given. However, those six million odd voters who lifted the challenger Maithripala to the throne by ousting its incumbent seem hardly satisfied. Interestingly, even some of the Rajapaksa fans too are bitter-tongued as their hero gave into a trap instead of becoming a true avenging rebel leader against the Maithri’s UPFA: ‘once a Judas is always a Judas!’, so they say of Maithripala Sirisena, a name that increases blood temperature of those who upheld him as well as withheld him just six months ago. Did he not have better options? This short piece will explore some of three other options he could have adopted, each, with devastating consequences. Maithri should have taken a leaf out of Mahinda’s book and do what he did to Sarath Fonseka in 2010 – Cut the cancer. Let’s examine the possible outcomes of each of these options briefly. What goes around comes around. But, what the then-president Mahinda Rajapaksa did to his challenger,Sarath Fonseka, in 2010 was a sorry scene in the eyes of someone who admires the right to differ. The essence of the January 08 mandate was to bid a permanent ‘Rest-in-Peace’ to that very kind of politics of destroying one’s opponents. Probably, the investigation process could have been fast-tracked. More thieves could have been caught, and put in jail. Yet, as the controversial resignation and resumption of duties of on member of the Bribery Commission (bringing the work of the institute to a stand-still) vividly exemplified, fighting a system that grew over a decade with months needs democratic patience or, yes, a guillotine. The second is not an option in our country, and it should never be anywhere. In order to protect and respect the essence of the January 08 mandate, democracy should prevail. Going by the standards that Mr. Mahinda Rajapaksa has set as the President, he should be thankful to his counterpart Mr. Sirisena for allowing him live a normal life, let alone doing politics. “President Sirisena was not given the mandate to take up the party that voted to send him 6 feet underground. But he backstabbed his supporters by putting the ‘Party before Country’ and taking up the leadership of SLFP and UPFA”: so goes the general criticism. Let’s look at the flip side of the coin – UPFA and SLFP would remain under the leadership of its former leader, Mr. Mahida Rajapaksa. 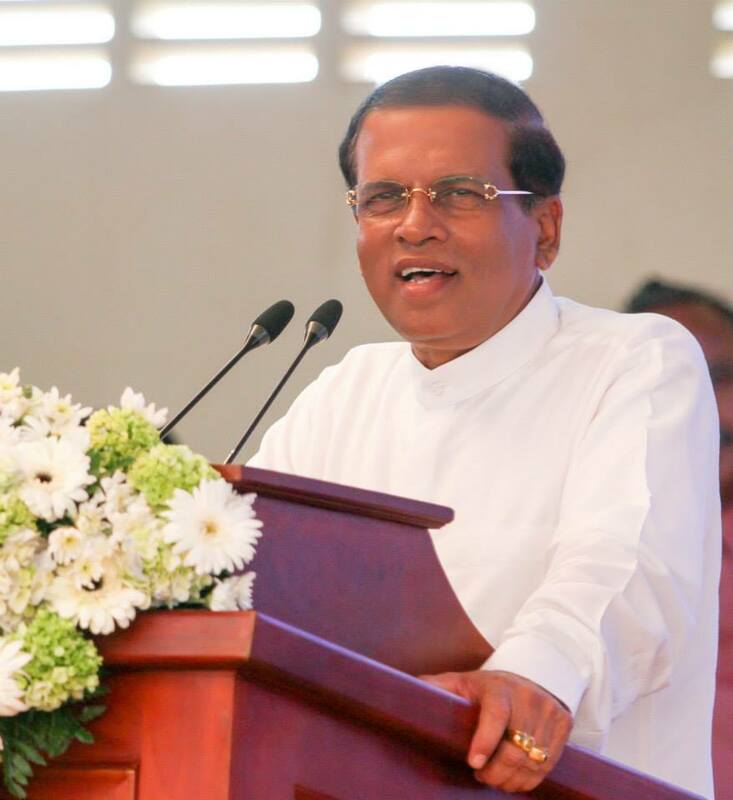 In the present election, he will challenge the UNP–led United National Front, formed with all individual leaders, groups and parties who stood behind Maithripala Sirisena’s victory. The ensuing battle will be a carbon copy of the January election, this time more aggravated and intensified with claims of ‘rising terrorism’ and calling for pseudo patriotism. Unlike under the chairmanship of the president Sirisena, contesting alone, the UPFA, which one of the largest party in the former parliament, will roar patriotism, howl ethnic pride, snarl ‘non-Sinhala’ hatred and cry out for ‘war’! The result will be a highly polarised election campaign denting and tarnishing the reputation of SLFP even further, and probably beyond recovery. So what? One may ask. On the one hand, being a country fighting hard to withstand allegations of human rights violations (case up for September in Geneva), and leaving one of the largest political parties in the country in the full control of the once-rejected, but increasingly militant chauvinist forces on the other, what has happened now seems much more tolerable and beneficial. The UPFA will be restricted to a more inclusive rhetoric, as its cunning advocates cannot say that President Sirisena paves the way for the rise of the terrorism in the country. The prospects are certainly better for the country that SLFP and UPFA are under the control of the January 08 mandate. “Don’t give him the SLFP ticket” was the catch phrase among millions for the last few weeks. Lucky if things are that rosy. However, how could the President uphold values of democracy within and outside the party and deny the chance for Mahinda Rajapaksa to run for this election? At least a few million people want Mahinda to run, he himself wants it, and a good number of the members in the party wishes so too. In such a demand driven situation, the President’s effort, if at all, to prevent Mahinda from getting the chit will be an outright autocratic act and therefore, by extension, a violation of the January 08 mandate. “So what about the March 12 declaration to keep those corrupted out of nomination lists and why do all same-old corrupt names reappear in the list?” – This needs explanation from them. Probably, to make decision making easy for the voters who want the March 08 be taken serious! Further, say, the President, in his capacity as the chairman of the UPFA and SLFP, denied the nomination to Mr. Mahinda Rajapaksa. That would lead to break away of the party, bringing about the scenario where a Mahinda rajapaksa runs for election under a different symbol but with more or less the same team as now. As such a coalition will break all ties with minority voters, he may strengthen bonds with the extremists such as the newly registered BJP (Bodu Jana Peramuna) led by BBS. We do not need more on that topic. However, there is another issue that needs to be taken into account, in case of a breakdown of the two party balance in the parliament, as a result of a possible breakaway from the UPFA. If the Maithri and Mahinda factions of UPFA were to trod different paths and contest from two parties, with UNF running separately, the ensuing situation has the potential of UNF reaching the possibility of obtaining a two-third power in the parliament, either with the support of the TNA, Mahinda breakaway group or another. The parliament under the 1978 constitution has seen two-thirds power in two occasions, in 1978 – 1989 and from2010 – 2015. Both were times of outrageous centralisation of power, the notorious 1978 constitution itself is a result of the 1977 elected 5/6 parliament and the 2010 parliament puts its hands up in blind in favour of the 18th Amendment that allowed for Mahinda Rajapaska to run for Presidency any number of times and tailor-make his dramatic fall in 2010 by trying to eat the whole cake. Such lunacies are possible only when the Parliamentary power swings too much in one direction. Any attempt to prevent that from happening is welcome. In that light, the current power balance will ensure some normalcy will prevail in the politics in the country under the next Parliament. The growing dissatisfaction and the feelings of betrayal by the voters bring about a classic case of expectations management. As the modern world has seen from the times of the French Revolution, the expectations of those who take part in a social uprising for a change for better are so great that any seeming disinclination to deliver on the promises is not tolerated. However, the events as they unfold before us call for a balanced view rather than to sensationalize the events as crucify the President for a perceived betrayal, as has been done by many journalists and newspapers. What the former President Mahinda Rajapaksa represents is a sizeable group of people of Sri Lanka, whose democratic right to engage, consent or dissent cannot be undermined. The President’s duty is to create the necessary space for the people of the country, who exercise their sovereignty, to make the right decision for the country. So far, it seems, as opposed to the popular criticism, President Sirisena has acted to uphold his mandate, while remaining reasonable and sensible. Given that Sri Lanka has sank deep in a decade-long Madamulana trench, it may require an ambitious day dreamer to expect things to take a U-turn just by casting a vote on a single day. What is entrenched in a system needs more hard work and commitment that keeping one’s hands clean and look into the stars only see the sand eroded under his feet. The fun that elections provide us is symptomatic of the mess we call the society. From fun to reason is the call of the hour. May reason prevail on the day of the election.